Hi! 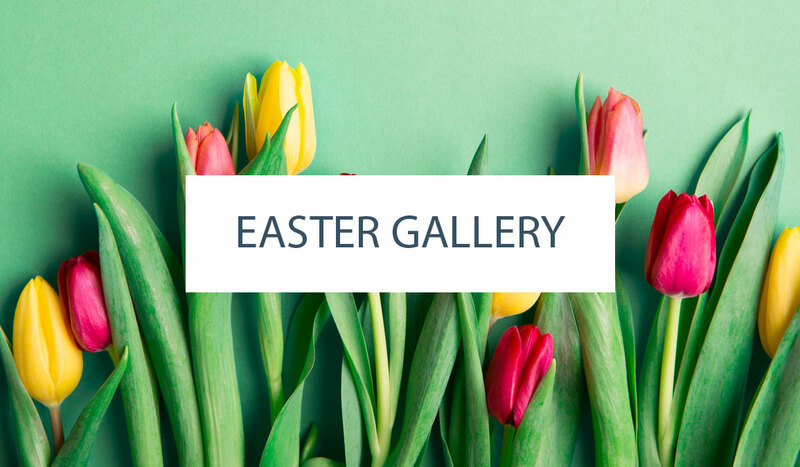 It’s Jessica from Pen N’ Paperflowers Studio & Design. I’m thrilled to be guest blogging today for Carrie at Half Baked!! 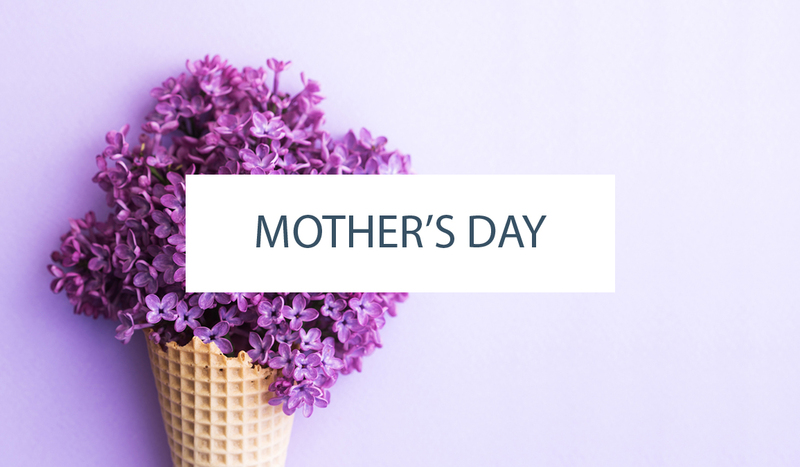 I’ve been fortunate enough to have had one of my parties featured here and I was flattered when Carrie invited me to do a little guest blogging. With the Fall holidays quickly on our heels, I thought now would be the perfect time to share with you – (and to find out for myself) – how to make those adorable felt acorns we’ve been seeing displayed on “Woodland Fairy” dessert tables around the web. Remove bundle of wool roving from packaging and unroll. (it’s quite long). Using scissors, cut a small strip of wool roving from one of the ends of the bundle. (approximately 2 inches long and 1 inch wide.) For these small acorns, you don’t need much roving. Wad up the cut piece of wool roving and place it on the needle felting mat. 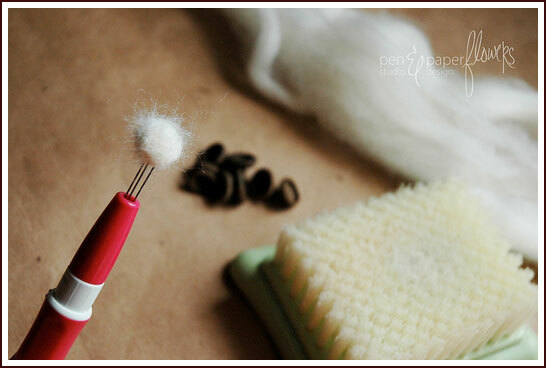 Hold the needle felting tool in an upright position with one hand. 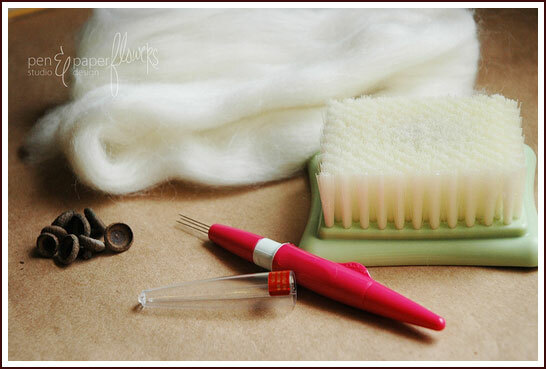 Hold the wad of wool down on the needle felting pad with the fingertips of your other hand. Begin puncturing the wool with quick up-and-down motions. AND BE CAREFUL!!! THOSE NEEDLES ARE SHARP!! 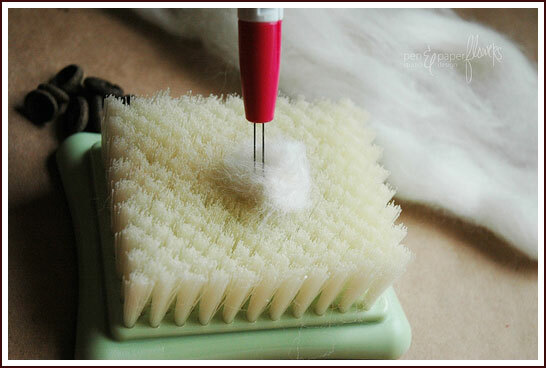 The bristles of the needle felting mat help to hold the wool down as well as provide a means for the needles of the felting tool to safely puncture completely through the fibers without damaging the tips of the needles. 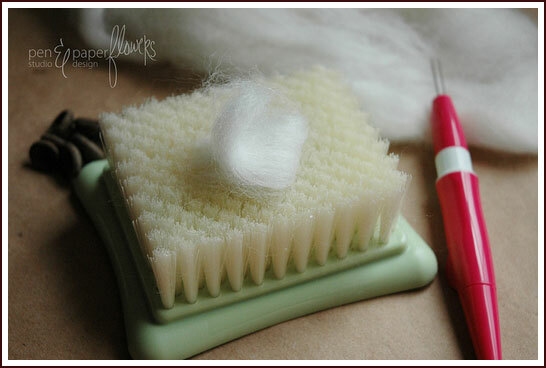 After 10-12 “stabs” with the needle felting tool, reposition the wad of wool and fold in the sides towards the middle. (almost the same technique used when you are kneading bread dough). Begin puncturing again. After repeating this process several times, you should begin to feel the fibers of the wool becoming thicker as they start to mesh together. Continue repositioning, folding and puncturing the wool until you end up with a round fuzzy ball. Continue to puncture the round ball to ensure the fibers have been tightly woven together. The wool ball should be somewhat firm. You are now ready to move on to the next step. 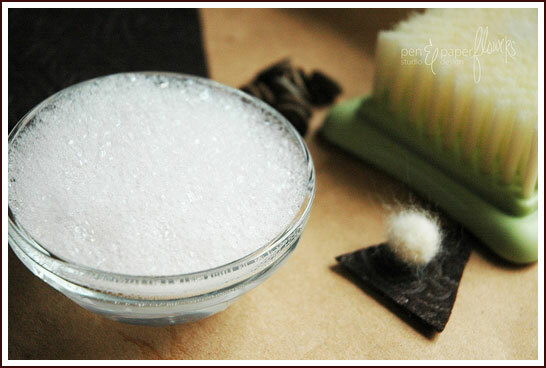 Place the fuzzy ball into a bowl of piping hot water and gently roll it in your fingertips. You’ll feel it start to contract and get smaller. Remove from the hot water and gently roll the ball in the palm of your hands to encourage a nice round shape. Re-dip into the hot water and continue the process until the ball feels harder and the shape is more defined. When you are satisfied, run the ball under cold water until the entire ball has absorbed the cold water. Resist the temptation to squeeze the excess water from the ball when you have finished. Let the ball air dry for a good 24 hours. (I’ve heard you can insert the wet balls into a stocking and throw them into the dryer to avoid the 24-hour waiting period. I haven’t tried it but I’m sure it would work great – if I had to guess, I believe the heat from the dryer will continue to shrink the ball – so be careful). 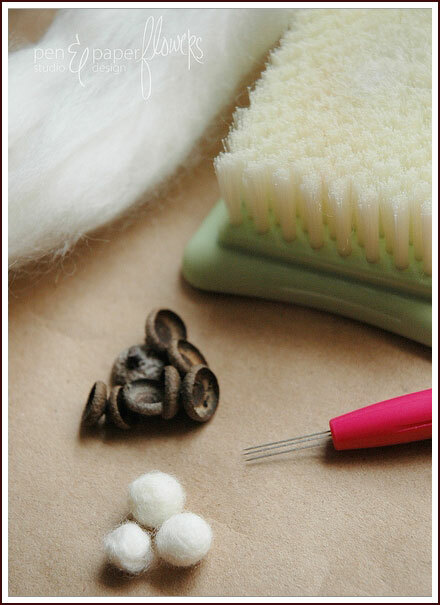 When your felt balls have dried completely, they are ready to be inserted into the empty acorn cupules. Because I haven’t been able to find my felt gun since our move into the new house, I chose to use a glue I had on hand, specifically for felt. 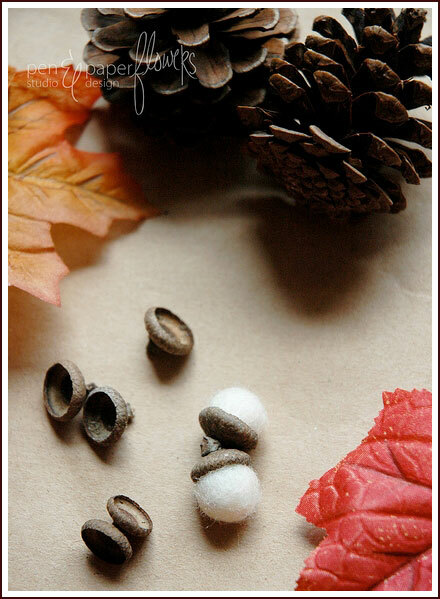 Simply squeeze a small amount of glue into the empty acorn cupule and insert the wool ball. The drying time will vary depending on which glue you use. They are SO adorable when they’re finished…aren’t they??!! 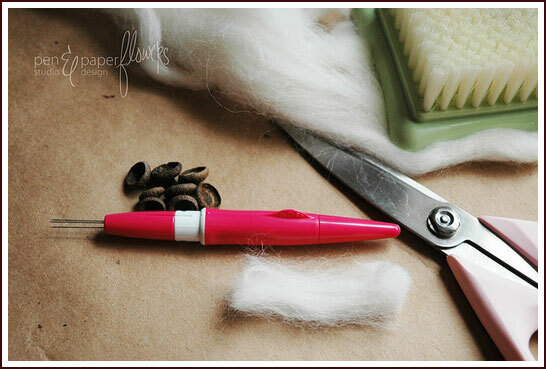 I hope you enjoyed the tutorial as much as I enjoyed learning a little bit about the art of needle felting. If you decide to make some of your own – I do hope you’ll come back and share with all of us… Enjoy!! Jessica Kirkland is the face behind Pen N' Paper Flowers; a creative lifestyle blog focused on inspiring others through Making + Baking + Photo-taking. She's a professed cake plate addict and loves charming baking books and cupcakes. Read more about Jessica on her bio page. very cute & do-able diy!! This is a fantastic tutorial! 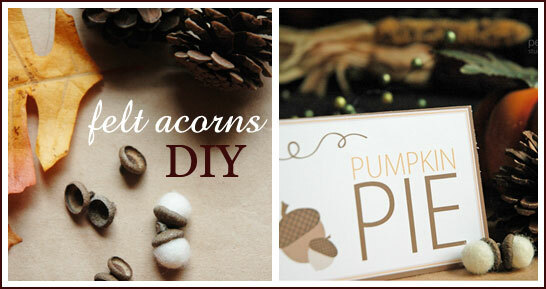 I’ve always wanted to try making these, especially since my mother-in-law has a fantastic oak tree in her yard and is always complaining of the mess the acorns make. I think once she has a basket of these, she would change her mind. Jess, it is so nice to see you featured! ‘Love this project. Thanks so much for sharing!! Wonderful tutorial!! I love the little acorns and your photography, top notch! These are so pretty and I love, love, love the pictorial. Great job Jessica! Thanks everyone! 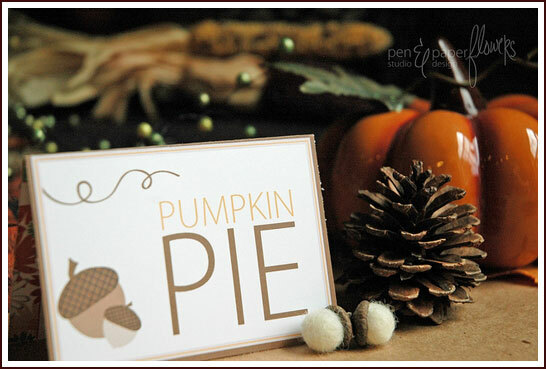 Thanks especially to Carrie for the opportunity to guest blog! I do hope you’ll come back and share your results if you try it out!! Thanks again Jess for sharing this with our readers! You’re the best!